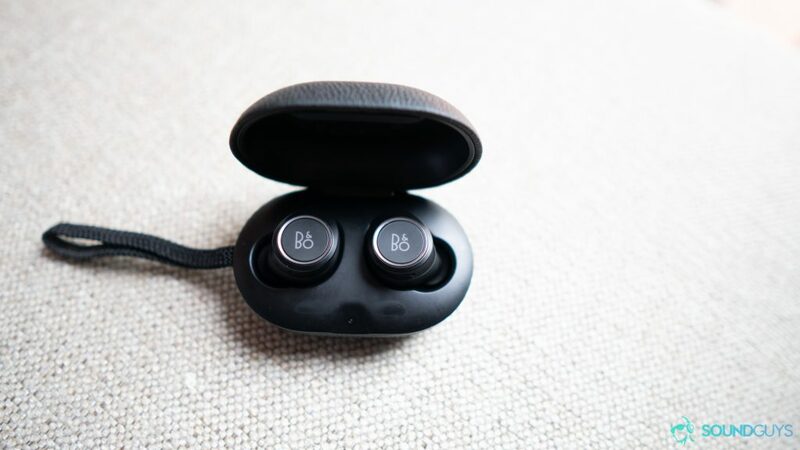 The Beoplay E8 true wireless earbuds have a great battery life and surprisingly good sound, but the high price and annoying connectivity make it hard to recommend to anyone that doesn't enjoy burning cash. But for those who are familiar with audio brands, the Danish brand can usually be associated with products that have good sound and great minimal designs. Case in point: the Beoplay E8 true wireless earbuds. Oddly enough, you probably won’t find these specific ‘buds in an Apple store as they compete with the AirPods. But one thing of note is that the Beoplay E8 earbuds cost almost twice as much as the AirPods. So, does that mean that they’re twice as good? Who are the Bang & Olufsen Beoplay E8 for? Commuters. Because of the long battery life and the transparency option that lets you hear what’s going on around you with just a tap of the left earbud, these are a pretty solid choice for commuters. People who prefer to be discreet. If you don’t want to look like Rudy Giuliani when you wear true wireless earbuds, these have a more discreet design. For a company that’s known for placing a strong emphasis on design, I’m a little disappointed with the Beoplay E8 earbuds. But first, let’s start with the charging case that they come in. The case is gorgeous. The leather exterior and an elastic band that make it easy to wrap around the key chain holder in your bag, so you always know where it is. It’s pill-shaped like the one that the Samsung Gear IconX comes in. However, B&O engineers actually thought about how it would look in your pocket—unlike Samsung—and made the case more flat and elliptical than it is round. That means when you pocket the case, it doesn’t look like there’s a giant tic-tac in your pocket. It’s the attention to the little details like this that makes them great at design, and at first, I was really impressed. But then I opened the case. True wireless earbuds are—by definition—smaller than headphones, because they need to rest in your ear instead of on top of them. But it looks like the company kept the same sized logo from their large over-ear headphones. In other words, the logo-to-earbud ratio is ridiculous. The entire outer edge of the earbud is basically the logo. Now you’re probably thinking, “Adam, relax it isn’t that big a deal.” And you’re right. It isn’t. But it’s a pet peeve of mine when I spend an exuberant amount of money on a product, and then I have to spend the rest of my days as a walking advertisement. And that’s without even getting commission. Usually, B&O handles this tastefully. I don’t mind using the products, but on something this small I refuse to believe there wasn’t a better way to go about it. Logo rant aside, the earbuds have a pretty simple design and are made entirely of plastic, which keeps them lightweight. The right and left earbuds to weigh only 7g and 6g, respectively. The right is a gram heavier because it’s the master earbud while the left is the slave. They’re also more squared off than some of the other ‘buds I’ve tried, which results in an aesthetically pleasing product that unfortunately doesn’t seem to fit properly in my ear. The Beoplay E8 ‘buds don’t fall out; they actually stay in nicely. The problem is that it doesn’t take long for them to become uncomfortable. After an hour I had to take them out to let my ears relax, and I was aware that I was wearing them the entire time. It’s not painful, just annoying. B&O claims that these are water resistant, but there’s no mention of sweat. So if you’re looking for a pair of earbuds for the gym, you might want to look elsewhere. Still, it’s good to know that if you get caught in the rain, you won’t have to spend another couple hundred dollars to replace these. Pairing the earbuds was easy enough. All you have to do is hold down the touch pad to enter pairing mode and watch the Beoplay E8 name pop up in the Bluetooth settings. What wasn’t as smooth was the B&O app. It has a hard time finding the earbuds, even when they’ve already been paired. Once it does, you’ll get access to extra features like some EQ presets and something that B&O calls transparency. What’s transparency? It’s basically the opposite of active noise cancellation. Instead of using built-in microphones to cancel outside noise, transparency uses microphones to let in sound from around you. There are three different presets you can choose from that each let in a different amount of noise. It doesn’t pause your music, instead, it just lowers it so you can hear what someone is saying. As someone who spends plenty of time on the train, I really like this feature. It lets me hear what the conductor is saying without needing to take out the earbuds. It also came in handy while waiting to hear my name called at Starbucks for my vanilla sweet cream cold brew. I don’t care; judge me. They’re delicious. As nifty as that feature is, I did have some other issues with connectivity. For one, the Beoplay E8 don’t seamlessly auto-connect once you open the case and take them out like some other true wireless earbuds do. Thankfully, I never had to go through the dreaded unpair/repair process, but I was tempted to. The only way I was able to get these to reconnect every time was by going into Bluetooth settings and tapping on “Beoplay E8.” For the price, this is unacceptable. On the bright side, they do automatically disconnect when you put them back in the case. As far as connection strength goes I didn’t have any issues with that either. I read a lot of other reviews saying these had a problem with dropouts, but I never experienced a dropout in regular usage. Only when testing the limits of its range did music falter and skip, but as long as my phone was within 20 feet of the earbuds, the connection was fine. On the other hand, if you’re going to be watching videos with these, you might want to reconsider as the delay is awful. It seemed like the audio would come a full second or two after the video. But to complete my good-bad-good sandwich, let’s talk about the playback controls because. Although they are a little complicated, they work perfectly. The right and left earbuds share some controls and differ in others. But once you memorize the correct amount of taps and holds, the touch-sensitive earbuds are easy to control. Another positive to these earbuds is the battery life. B&O claims about four hours of constant playback and nailed it. In our testing, we got around 4.45 hours making it one of the best true wireless earbuds we’ve tested. If you have a long commute these will have you covered. Then you can just toss them back in the case which will give you another two extra charges before it needs to be recharged via the micro USB port on the back. But make sure that you put the earbuds back in the right way, or you’ll end up like me opening the case the next day only to find that one earbud didn’t properly charge. The case uses magnets to hold the earbuds in place and also to keep the charging case closed properly. This worked fine for keeping the case closed, but the problem is that putting the Beoplay E8 earbuds in the case and closing it, doesn’t mean that they’re properly in place. You have to take an extra second to make sure it’s actually charging (you can tell via two small LED lights on the back of the case). In the B&O app, you can tweak the way your music sounds via a screen that lets you drag a ball between four options: warm, excited, relaxed, and bright. Very descriptive… What’s a little more helpful are the presets. They’re self-explanatory with names like commute, clear, workout, or podcast. For the purposes of this review, I kept all of these turned off, so I was only listening to music the way they sound fresh out the box. The Beoplay E8 earbuds don’t have some of the better Bluetooth codecs for higher quality data streaming, but they do have AAC so if you have an iOS device or a fairly new Android device you’ll use that instead of the default SBC. At first, listen the low-end seemed to be a little weak for my liking. But the more I listened the more I enjoyed it. Don’t get me wrong it didn’t do justice to the sub-bass in Summertime Magic by Childish Gambino, but the alternative for earbuds this small is an artificially exaggerated low-end that ends up masking more important notes in the mids (like vocals). Though the lower notes weren’t strong, they’re still clearly audible. But where the low end manages to scrape by without sounding fake, some vocals end up sounding like you’re listening to them from behind a stage curtain. It’s not exactly muffled, but you don’t get some of the details that make the vocal performance great. For example, during the first chorus of Gimme All Your Love by Alabama Shakes (about 1:05 minutes into the song) Brittany Howard chuckles in the background, and I completely missed it on my first listen because of everything else going on. I had to rewind the track and give it another go to catch it behind everything else going on. That said, I found that the treble reproduction surprisingly good (considering the 5.7mm drivers making all the sound). Throughout the song Katie Queen of Tennessee by The Apache Relay there’s plenty of cymbal play throughout, and though you can hear it, they don’t exactly sound like they’re providing a sense of space. They’re easy to hear which is good, but because of the lack of soundstage, or perceived 3D space, they aren’t able to fill the space how they should. 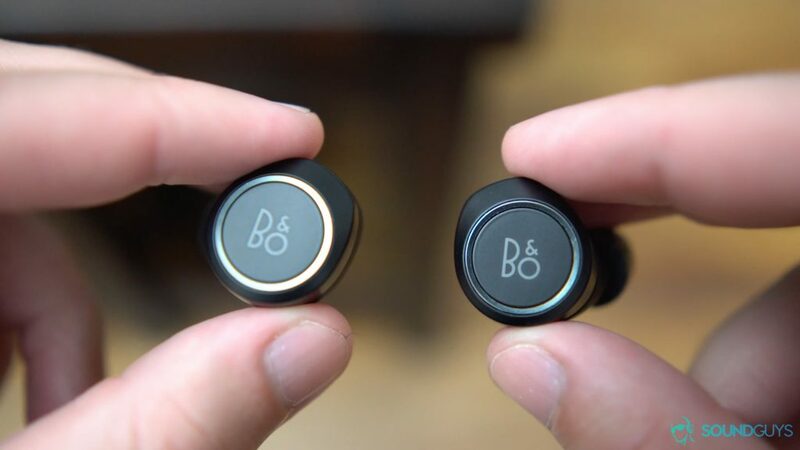 When it comes down to it, the main question is are the B&O Beoplay E8 true wireless earbuds worth the price tag when there are cheaper options available? For most people, probably not. 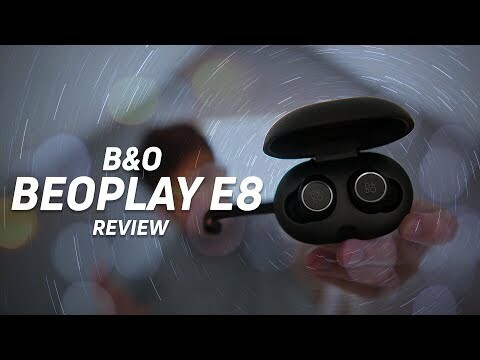 The Beoplay E8 sound good considering they are true wireless earbuds and they have some truly practical passthrough features for commuters or anyone in an office. But they’re held back by their uncomfortable design, annoying connection process, and just an okay sound. Not to mention that for something that costs as much as these do, I want true sweat-resistance not just water and rain. I should be able to use these anywhere I want for that price, but instead, it’s limited to only a few select use cases. Plus, as much as I liked these they aren’t the best in any one category. The Jabra Elite 65t beat them in battery life, the Gear IconX have better features, and even the AirPods beat them in connectivity. And if you know me, you know how rare it is for me to give any kind of praise to those q-tips. Are the Beoplay E8 true wireless earbuds any good? Sure, but that doesn’t justify a purchase.